Prof. I.R. 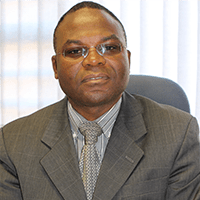 Sunny, an expert in Environmental Health, Public Health & Project Management, is presently a senior lecturer and DEAN of Faculty of Health Sciences, National University of Lesotho (NUL). Graduate Assistant Lecturer- Laboratory of Microbial Ecology & Technology, Faculty of Applied Biological Sciences, Ghent University, Belgium. Prof. Sunny is a global scholar who has published widely in the fields of Environmental Health, Public Health and Project Management. He is an acclaimed RESEARCH AWARD Winner. He has supervised SEVEN M.Sc.in Environmental Sanitation Dissertations (2 Winning Country-Wide Industry Awards in Belgium), Co-supervised TWO M.Sc. Dissertations in Soil Science, and numerous B.Sc & B.A Dissertations.